Meaty Treats Meatball Delights Chicken Flavored Meatballs are a delightful, in between meal snack that your dog will love. Because we care about the quality of our pet treats, we chose to use real chicken in this unique formulation. This tasty snack has an eye appealing meatball shape and chewy texture that will entice your dog to want more. 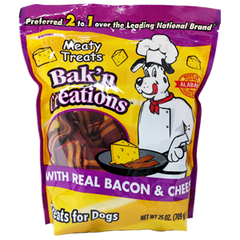 Plus, the chicken flavor creates a mouth watering aroma that your dog will find irresistible. By choosing to feed your best friend Meaty Treats Meatball Delights Chicken Flavored Meatballs, you are choosing a bright future for your pet! Chicken, Wheat Flour, Chicken Meal, Rice Flour, Corn Syrup, Propylene Glycol, Pregelatinized Corn Flour, Chicken Fat (Preserved with Mixed Tocopherols), Salt, Fish Meal, Natural Flavor, Citric Acid (Source of Vitamin C), Calcium Carbonate, Calcium Propionate and Sorbic Acid (to maintain freshness), Lecithin, Monodiglycerides, Natural Smoke Flavor.